In a forest there lived a lion. He had grown old and could not run fast anymore. As days went by it became more and more difficult for him to hunt. One day while he was wandering through the forest in search of food, he came across a cave. He peeped in and smelt the air inside the cave. “Some animal must be staying here," he said to himself. He crept inside the cave only to find it empty. “I will hide inside and wait for the animal to return," he thought. The cave was the home of a jackal. Everyday, the jackal would go out in search of food and return to the cave in the evening to rest. That evening, the jackal after having his meal started towards home. But as he came closer, he felt something wrong. Everything around him very quiet. “Something is wrong," the jackal said to himself. “Why are all the birds and insects so silent?" Very slowly and cautiously, he walked towards his cave. He looked around him, watching for any signs of danger. As he got closer to the mouth of the cave, all his instincts alerted him of danger. “I have to make sure that everything is alright," thought the jackal. Suddenly, he thought of a plan. The clever jackal called out to the cave. “Hello my good cave, what happened to you today? Why are you so quiet?" The jackal’s voice echoed deep inside the cave. The lion, who by now could control his hunger no longer, thought to himself, “I think it is because I am here that the cave is silent. Before the jackal realises that something is wrong, I should do something." The jackal continued to call out, “Have you forgotten our agreement cave? You are supposed to greet me when I return home." The lion tried to make his voice sound hollow and called out from within the cave, “Welcome home my friend." The birds chirped loudly and flew away on hearing the lion’s roar. As for the jackal, he shook with fear. 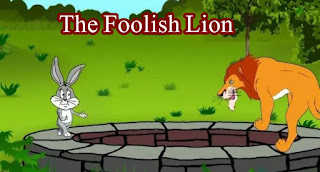 Before the hungry lion could pounce on him and eat him up, the jackal ran for his dear life as fast as his legs could carry him. One day an elephant wandered into a forest in search of friends. He saw a monkey on a tree. “Will you be my friend?" asked the elephant. Replied the monkey, “You are too big. You can not swing from trees like me." Next, the elephant met a rabbit. He asked him to be his friends. But the rabbit said, “You are too big to play in my burrow!" Then the elephant met a frog. “Will you be my friend? He asked. “How can I?" asked the frog. “You are too big to leap about like me." The elephant was upset. He met a fox next. “Will you be my friend?" he asked the fox. The fox said, “Sorry, sir, you are too big." 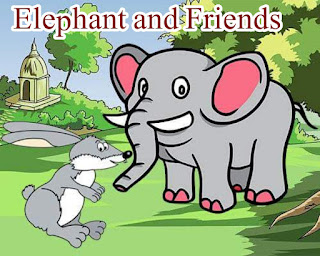 The next day, the elephant saw all the animals in the forest running for their lives. The elephant asked them what the matter was. The bear replied, “There is a tier in the forest. He’s trying to gobble us all up!" The animals all ran away to hide. The elephant wondered what he could do to solve everyone in the forest. Meanwhile, the tiger kept eating up whoever he could find. The elephant walked up to the tiger and said, “Please, Mr. Tiger, do not eat up these poor animals." “Mind your own business!" growled the tiger. The elephant has a no choice but to give the tiger a hefty kick. The frightened tiger ran for his life. The elephant ambled back into the forest to announce the good news to everyone. All the animals thanked the elephant. They said, “You are just the right size to be our friend."